Dry to moderate moisture. 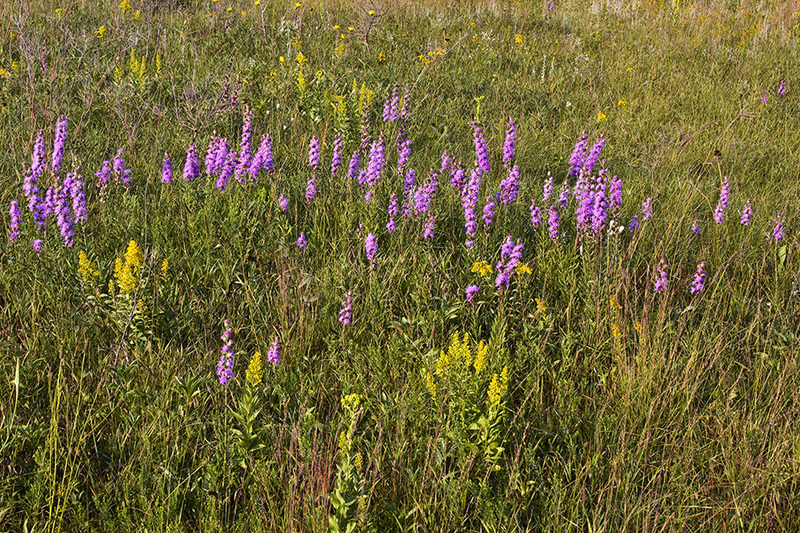 Prairies, wood openings. Sandy soil. Full sun. 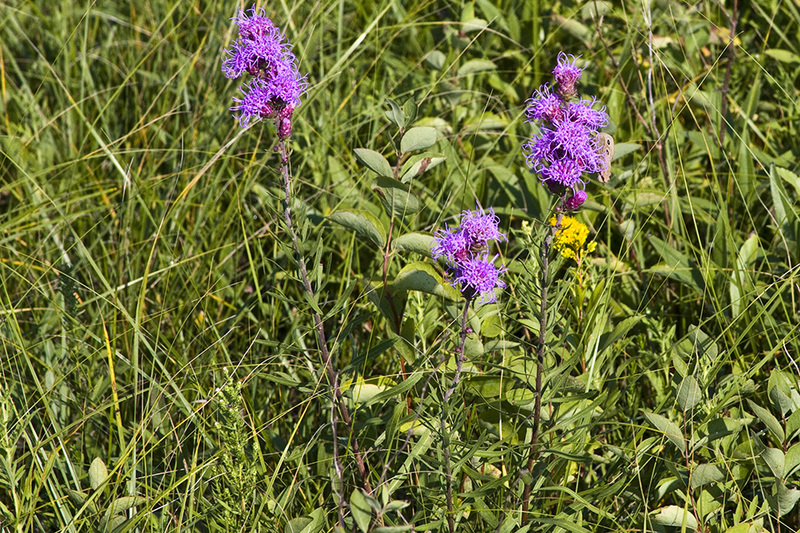 This is an erect, perennial forb that rises on one or two stems from a large, globe-shaped corm. 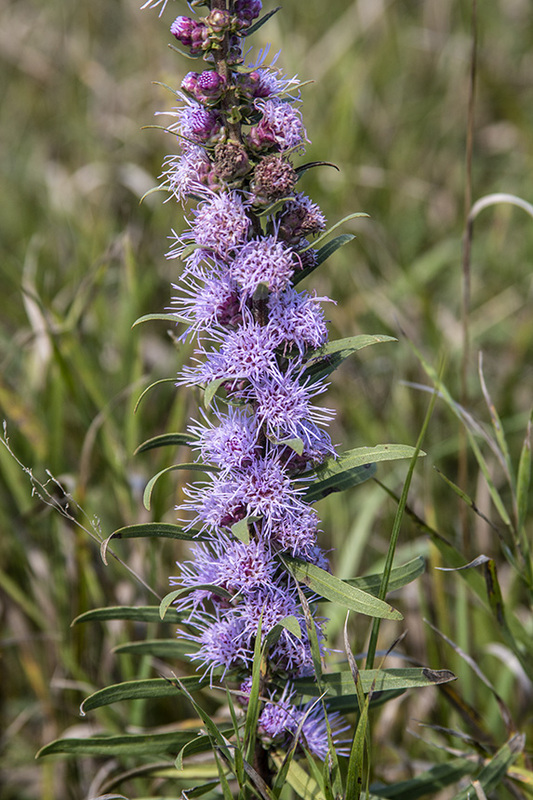 It can be from 12″ to 70″ tall, though in Minnesota it is usually at least 20″ and less than 48″ in height. The stems are erect, round, ribbed, leafy, green or dark red, unbranched, and rough to the touch. It is moderately to densely covered with short, stiff, curled, upward-pointed hairs. It is often mostly hairless near the base. Basal leaves are broadly lance-shaped to narrowly elliptic, 3″ to 10″ long, and ¼″ to 1″ wide. They are on leaf stalks up to 4″ long. They have 1 main vein. The upper and lower surfaces are rough to the touch due to a sparse to dense covering of minute, stiff hairs. The margins are untoothed. Lower stem leaves are similar, alternate, linear, ¾″ to 3½″ long, and 1 ⁄16″ to ¼″ wide, becoming stalkless and gradually smaller as they ascend the stem. There are 25 to 90 stem leaves below the inflorescence. 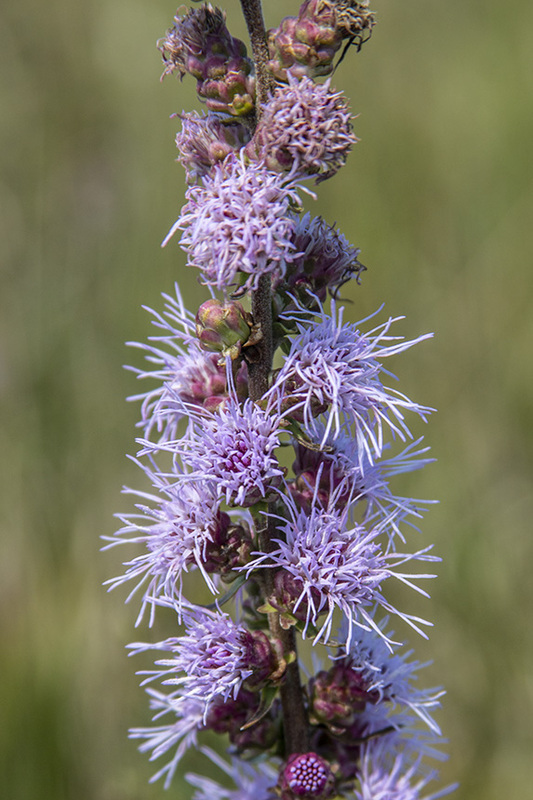 The inflorescence is an unbranched, elongated, 6″ to 13¾″ long, spike-like cluster of 10 or more flower heads at the end of the stem. The heads are loosely to densely spaced and the axis of the inflorescence is usually visible between the heads. They are stalkless or are on stalks that are 1 ⁄32″ to ⅜″ long, though usually no more than 3 ⁄16″ long. The stalks are spreading or sharply bent downward. They usually have a single, small, leaf-like bract at the base. 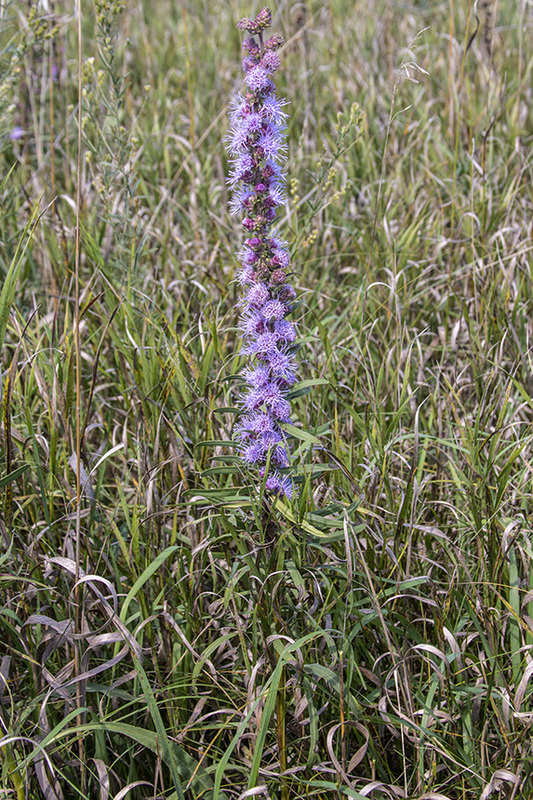 The flower heads are about 1″ wide. The terminal head is not longer than the others. The whorl of bracts at the base of the flower head (involucre) is broadly cup-shaped to broadly bell-shaped, ⅜″ to ⅝″ long, and ⅜″ to ¾″ in diameter. The bracts making up the involucre are in 4 or 5 overlapping series. They are broadly inversely egg-shaped to oblong spatula-shaped. The lower (outer) and middle series are spreading or bent backward. They have rounded, blistery projections on the back, making them appear inflated. They have broad, thin, pale or purple to transparent margins. The margins are strongly bent upwards and appear irregularly torn. The flower head has 14 to 34, usually 18 to 24, disk florets and no ray florets. Each disk floret has 5 petals fused for most of their length into a tube then separated at the tip into 5 spreading lobes. The corolla tube is 3 ⁄16″ to ¼″ long, white at the base grading to pink at the tip. There are 5 stamens concealed within the corolla tube and a long, white to pink, forked style that protrudes well beyond the tip of the corolla tube. There is no fragrance. The fruit is an achene with hair-like bristles attached. The bristles are feather-like (plumose), though this may be difficult to see without a hand lens. 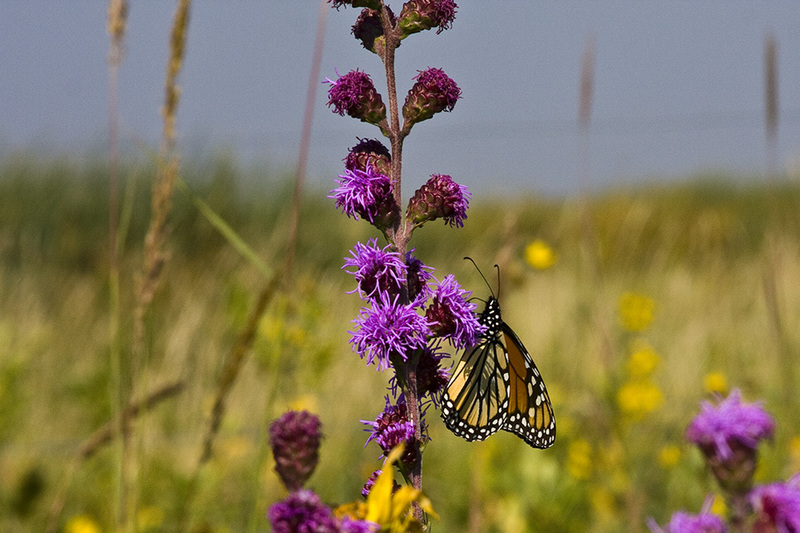 A rare, white-flowered form is rough blazing star (Liatris aspera var. aspera f. benkei). 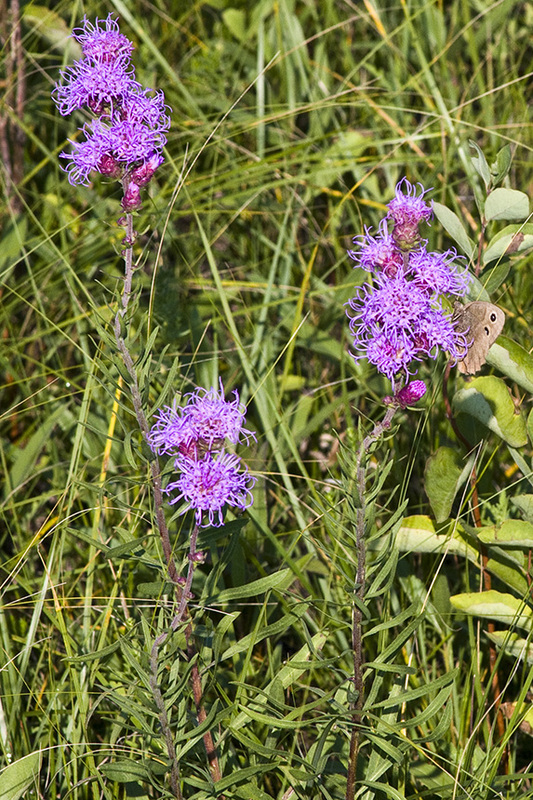 Northern plains blazing star (Liatris ligulistylis) flower heads are on longer stalks. 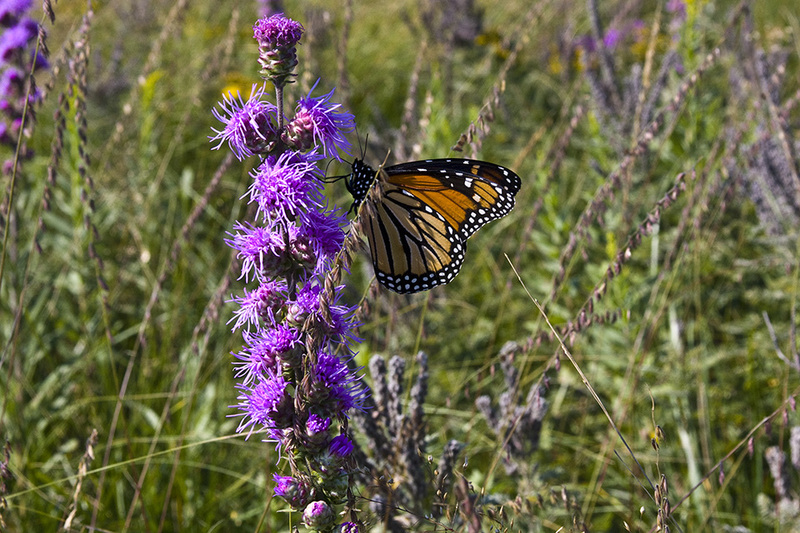 Rough blazing star (Liatris aspera var. intermedia) upper and lower leaf surfaces are hairless. Feathery; having fine, pinnately arranged, lateral bristles or hairs arranged on both sides of an axis.